XLA has been issued U.S. Patent No. 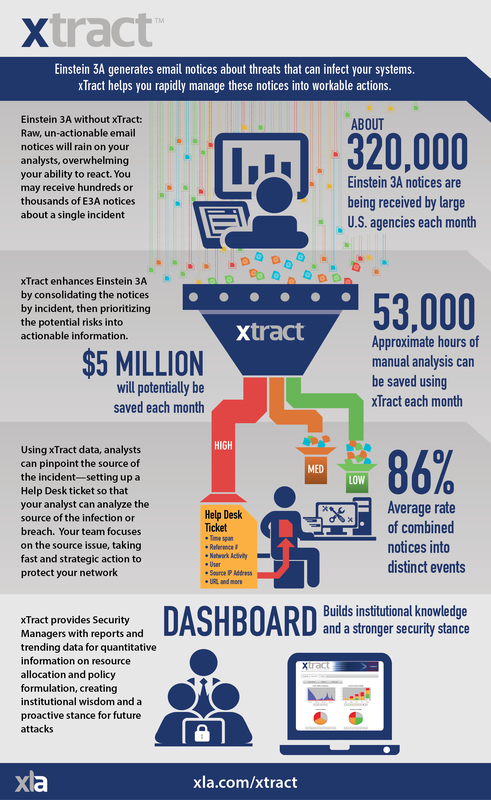 9,385,933 B1 for xTract, our cyber-threat mitigation solution that identifies specific threats to government networks. XLA developed xTract as a solution to the hundreds or even thousands of notices each day that are generated by Einstein 3A. Einstein 3A or E3A is the Department of Homeland Security’s (DHS) cybersecurity analysis, situational awareness, and security response system. Einstein 3A detects malicious traffic targeting Federal Government networks and also prevents malicious traffic from harming those networks. Under the US-CERT E3A program, a Federal agency will receive a notice that Einstein 3A identified a threat and prevented the threat from infecting the agency’s IT network. The notice, however, does not identify the specific threat or where within the agency the threat originated. XLA’s xTract automatically ingests the tens of thousands of notices generated by Einstein 3A each day, and shrinks them to just a few prioritized incidents. xTract quickly and easily identifies a threat, enables agencies to mitigate the threat, and helps officials develop policies or programs to prevent a reoccurrence of the threat. By shrinking the flood of E3A notices to just a few actionable incidents, the challenge is reduced to a manageable size. XLA has also developed a stand-alone xTract E3A Diagnostic to help IT security officials in U.S. Government agencies understand the scope of their challenge and prepare before implementation. Following the 4-week xTract E3A Diagnostic, agencies will better understand the number of email notices they receive, network operations impact from these notices, and the staffing requirements needed to identify and mitigate threats identified by E3A. XLA is proud of the U.S. Patent it has been issued. We are confident about the positive impact xTract will have on Federal Agencies. To learn more about xTract call us at (703) 848-0400.